Today was a good day. Some shunt and scar tissue pain this morning around 3am. So far it's been a nice pain free day. I won't write too much, as I suspect the programmable shunt may hear my thoughts and retaliate. I will continue to enjoy this calm. I hate you, because you cause me pain. I'd like my old shunt back. I'd also like the brain I had before the multiple brain injuries I had. I know one thing for sure, my programmable shunt valve reacts to the weather and causes scalp and nerve pain. I also know it responds to the slit ventricle syndrome I acquired between 2009-2014. I can feel when csf fluid is being pushed through the valve. It could be because of the resistance level ( level 11 ) which is considered high, however it's what I needed as a lower level ( 8, 10 ) caused my head to bob up and down involuntarily and I could feel explosions going off in my skull. the white space ( top left corner ) is scar tissue from my brain injuries. The rain will be here soon and it's humid outside. I can tell because of how my shunt and scalp feels. Since the early hours of 3am, I've had throbbing pains on the shunt valve, occasionally in my abdomen where the distal catheter ends and in different parts of my scalp from the scar tissue. My brain looks like a walnut. In response to my cerebral shunt attempts to predict the impending rain tomorrow, I've posted a question on a hydrocephalus support group I'm a member of online about how other people who have programmable shunt valves cope with pain issues associated with the changing weather patterns. *Update as of 9/19 - It's been raining all day today and sure enough, my shunt is responding to it with pain on the shunt valve and upset stomach were distal catheter ends. Some of the responses I've received from my original question posted online have been the same: Pain is from changes in weather patterns, sometimes pain medication helps, others just lay down to deal with the pain. If I don't have to go anywhere, I stay home curled up somewhere. Pain medication works for headache pain, not for my shunt, scalp and nausea pain. Other people with shunts have said they can too can predict when it's going to rain before it occurs because of how they're shunt responds. I have a love and hate relationship with my cerebral shunt. This new version causes me pain depending on the weather outside and other magnetic fields in the area. The last month it's been somewhat difficult emotionally and physically, as I've had head and shunt pain for the most days. This morning, I got up early due to pain on the left and right front parts of my head as well as in the back of my head. The cerebellum headaches, from what I was told by a neurologist are from the chiari malformation (type 1) which I have. These don't happen often. Into the evening, I'm feeling better than I was this morning. A shunt with status updates would be appropriate. I stopped taking my prescribed pain medication and had informed my neurologist of my decision to do so. 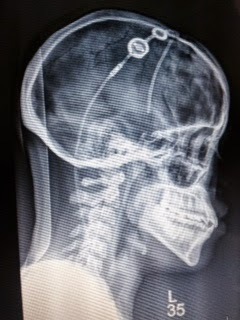 My reasons behind this was because there was no improvement in the pain I experienced from my shunt or in different parts of my head. The pain I feel, as I explained to my doctor, was a result of the trauma I experienced while having surgery in 2014. When I saw the new neurosurgeon a new months ago, he discovered patches of scar tissue which were still healing. The neurologist listened and told me if I ever change my mind about taking medication I can just call her and she'll send a prescription to the pharmacy.